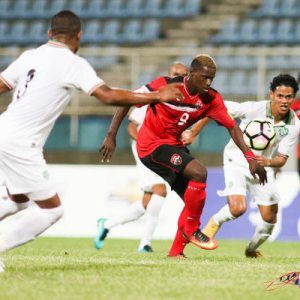 Trinidad and Tobago National Senior Team coach Stephen Hart selected eight uncapped players for friendly international action against Grenada on March 19 in just his team’s second outing of the year. 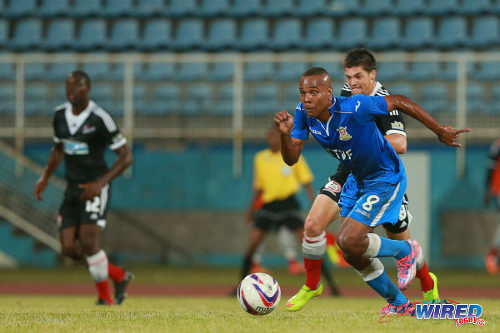 Photo: Central FC attacker Nathaniel Garcia (left) runs at St Ann’s Rangers defenders Trevin Latapy (centre) and Jelani Peters during the 2014/15 Pro League season. The exhibition match falls outside the FIFA international calendar but, thanks to a fixture reshuffle by the Pro League, Hart had his choice of home-based talent. 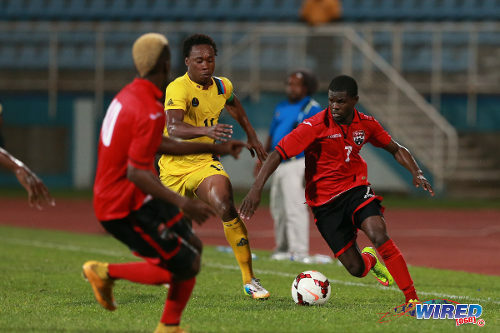 The “Soca Warriors” coach said he intends to use the match to help create a deeper player pool. Eight of Hart’s squad have junior FIFA World Cup experience for Trinidad and Tobago. 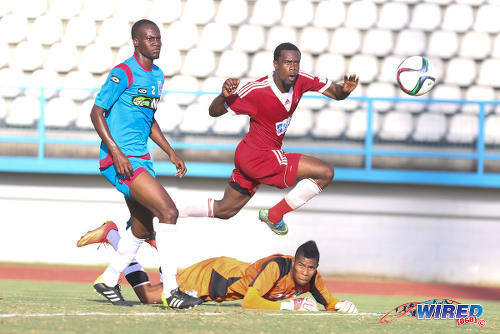 Goalkeepers Marvin Phillip (Morvant Caledonia United) and Jan-Michael Williams (Central FC) were both members of the 2001 Under-17 World Cup squads. And Daneil Cyrus (W Connection), Curtis Gonzales (Defence Force), Khaleem Hyland (KV Westerlo—Belgium), Leston Paul, Marcus Joseph and Sean De Silva (all Central FC) wore red, white and black at either the 2007 Under-17 and 2009 Under-20 World Cups or both. 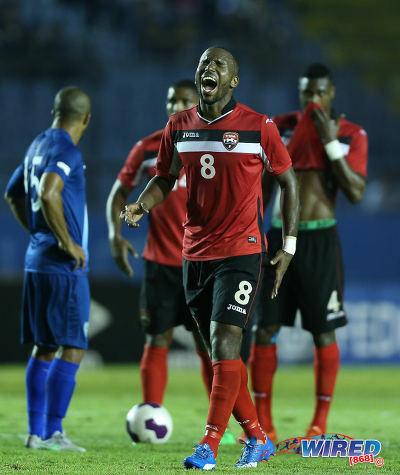 Photo: Trinidad and Tobago midfielder Khaleem Hyland (centre) roars during Russia 2018 World Cup qualifying action in Guatemala City on 13 November 2015. Hyland is the only overseas player in Hart’s 22-man squad, which, as expected, leans heavily on defending champions, Central FC, and the youthful W Connection set-up for the bulk of his team. 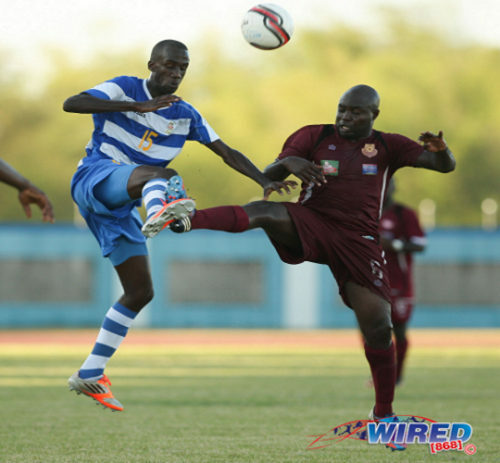 Central and Connection contributed eight and six players respectively to the Warriors outfit with three from Defence Force, two from Police FC and one apiece from Club Sando and Morvant Caledonia United. The potential debutantes include Pro League top scorer Makesi Lewis (Police), 2015 Pan American Games Under-23 players Triston Hodge (W Connection) and Nathaniel “Spanish” Garcia (Central FC) and 2015 CONCACAF Under-20 Championship midfielder Akeem Humphrey (Club Sando). Defence Force captain Jerwyn Balthazar and defender Jamali Garcia and Central defender Andre Ettienne and left back Kevon Villaroel complete the list of international newcomers. Balthazar, who is 33 years old, is the oldest member of the squad but was rewarded for his consistency and goal scoring form this season. And, although he has never won a cap for the Warriors, he is an accomplished international indoor player and the current national Futsal captain. Lewis and Garcia (N) have both been eclipsed by younger siblings but will now get a shot to showcase their own abilities. Lewis’ little brother, Micah Lewis, represented Trinidad and Tobago at the 2007 Under-17 and 2009 Under-20 World Cups, while Garcia (N) is the elder brother of Netherlands-based teenager, Levi Garcia, who is in line to make his own debut in upcoming World Cup qualifiers against St Vincent and the Grenadines on March 25 and 29. Thirty two year old Central winger Jason Marcano is another exotic selection. Marcano has 11 caps under his belt spread among four former national coaches—Wim Rijsbergen, Anton Corneal (while stand-in for Francisco Maturana), Russell Latapy and Hutson Charles—but has never represented his country in a competitive fixture. 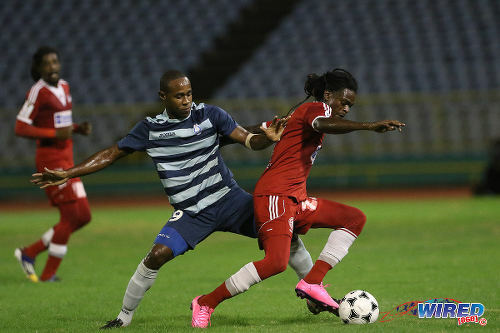 Photo: Central FC winger Jason Marcano (right) tries to elude Police FC forward Makesi Lewis during 2015 First Citizens Cup quarterfinal action at the Hasely Crawford Stadium. Marcano too has benefitted from red hot recent form with the “Couva Sharks.” He would also relish the chance to show that his unorthodox dribbling and precise crossing matches international standards. His Central, De Silva, has been sounded out to play for Guyana and Antigua and Barbuda at senior level due to family ties—although he represented Trinidad and Tobago at two junior World Cups—but has so far resisted overtures in an effort to prolong his international career with the land of his birth. Joseph is, arguably, the player to watch for in Grenada, as he managed at least one goal in his last seven successive games for the Sharks and totalled eight items during that period. Joseph’s five caps under Hart thus far—all in friendlies—have primarily been as a winger, which is not his preferred post. 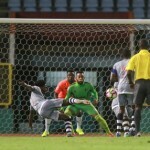 Photo: Central FC attacker Marcus Joseph (centre) scores the game winner in TT Pro League action on Saturday while St Ann’s Rangers defender Shakiyl Phillip (left) and goalkeeper Christopher Biggette watch on. 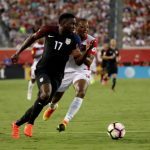 A shortage of “number 10s” available to Hart—Kevin Molino is still recovering from a lengthy injury-enforced lay off, Keron Cummings is injured and Ataulla Guerra just joined Charleston Battery (US) and has not convinced—might open the door for Joseph to play alongside captain Kenwyne Jones in St Vincent, if the former World Youth Cup player impresses on audition in Grenada. The more established travellers in the squad are JM Williams, who captained the squad in their 2016 Copa America Centenario play off loss against Haiti on January 8, his capable deputy, Phillip, and the versatile Cyrus. Connection attackers Jomal Williams, who leads Pro League scorers with goals in all competitions, and Shahdon Winchester have kept their place in the squad from the Copa play off while club teammate Hughtun Hector is also regaining full fitness after injury. 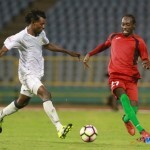 Connection captain and defender Alvin Jones, who is the younger brother of Warriors star Joevin Jones, Police FC utility defender Elijah Belgrave, Gonzales and Paul, who captain Defence Force and Central respectively, complete Hart’s squad. 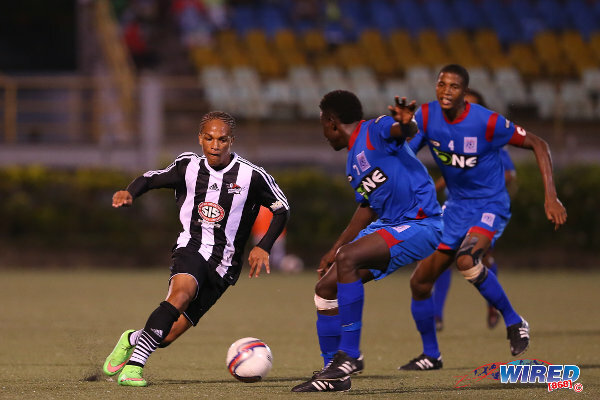 Photo: Defence Force midfielder Curtis Gonzales (centre) beats Central FC’s Sean De Silva to the ball during 2014/15 Pro League action. “This game will serve its purpose (in widening the player pool) and it provides that opportunity for players who have been knocking on the door,” said Hart. “And of course we have a few of the regular squad players who will add that stability and experience to the team that will play in Grenada. The team will enter a training camp on Sunday and will hold its first training session on Monday morning at the Manny Ramjohn Stadium. Hart will be without his six Central FC players who are in Jamaica until Sunday night for their CONCACAF Champions League qualifying series. The Warriors travel to St George’s on Friday March 18 and will tackle Grenada from 7 pm on March 19 at their National Athletic Stadium. 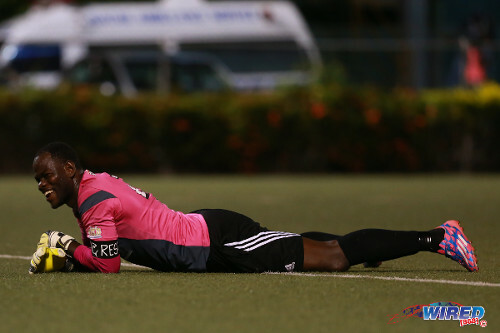 Photo: Central FC goalkeeper Jan-Michael Williams enjoys a light moment during a 2014/15 Pro League outing against North East Stars. Trinidad and Tobago’s next home match will be their World Cup qualifier against St Vincent on the Grenadines on Tuesday 29 March at the Hasely Crawford Stadium in Port of Spain. Tickets are priced at TT$300 for the covered section and TT$150 for uncovered and fans can buy them at Sports and Games or Kenny’s Sports outlets nationwide as well as at Sportway (Ellerslie Plaza and Gulf City) and Ramsingh’s Sportworld (Couva). Tobago fans will be able to purchase tickets at Heritage Sports in Scarborough from Friday while tickets are also available online from Wednesday March 9, via the TTFA’s official website – www.TTFootball.Org. Forwards: Shahdon Winchester (W Connection), Marcus Joseph (Central FC), Makesi Lewis (Police FC). Trevin Trev Trev Latapy wha going on dey, lol yuh get beat or ya jam him? Hahaha!! U know i am an orphan now but my father was a spiceman so i have a better chance to coach that team than u!! lol an for d record u will b a good trini td but u will face some detractors!! Always star who can deny the Trini in me . Yet I am more Guyanese than Colin Benjamin who shame to say he is Gt so I got to reflect. When the ship bring us here they did not bring us as TT or Gt thus nothing stopping me from coming up against TT next week in Grenada. Leo Beenhakker say in football 1 and 1 is not always 2. Haha Jamaal behave ur self!! We all c ur profile pic is trini and gt u is!! And Gordo how you know I might not be eating flying fish soon or coming up against TT saturday with lots of spices. You seem to be a gambling man place your bet nah. Wrong this time Wired . You cannot take a fire fighter and put him in an office. With all this bush fire in T&T. Not because I was a staunch supporter of David John Williams campaign you can pin a job for the boys title on me star. Trust me if you see I get as much as a garbage boy job in TT football know that I like my others in this country…put my life in this thing. Technical director jamaal shabazz like how u active on site!! Good selection, let’s see what they will do..
And this I have been saying for a very long time now that they have to continue to raise the standards of our professional league at home in order to have a strong home base set of players that can be part of the pool that Coach Hart needs with our foreign base professional players because I always believe that our players at home will give plenty more in the game because they are trying to make it professionally abroad compared to our players that made it already. And the football really needs to return to our communities with better fields and seating areas in order to get the real crowd support. I know that Mahaica Oval is under repairs and the pro league is also using that good field in Barataria I think Barataria Ball players home field for games so once this is done the standard will really raise again and of course the teams can now generate their own funds in the communities. I am happy to see the TT pool widen and also give a chance to a team like Grenada to get a big team warm up. More matches like these outside the fifa window will make the local based players see a pathway from performances in the league towards like a TT A team then on to the full National team. Hope these young players demonstrate the kind of commitment that the coach needs. Good luck guys, make the most of your opportunities. USA is a well organized team, but if we get the right guys to take some risks and run at them with the ball it makes them uncomfortable. We have guys with the skills to do it. The problem I see with our team is that we don’t have a midfield playmaker/ goalscorer like Russel The magician Laterpy, Autis Whitley, Hudson Barber Charles, and I am sure that you can name a few more who have represented our sweet country in the past, I really thought that Hyland would have been that kind of player when he first came on the scene but I was told that when he made it professionally abroad the team used him as a defender, and the next thing that we really missing is two prolific goalscorers upfront that really knows how to score the goals and if we don’t fix those two departments quickly the USA team will continue beating us eh. Yeah and finally he got his chance eh, well done Coach Hart. The Garcias will bring back T&T football to the top.. well done natty this is ur time … levi done there ..Judah and Isaiah next in line..
U going d svg game down here? Or well yea true ? Na dem probably won’t get release from their clubs, @ Wesley, cuz it’s not an official FIFA recognized match, so mostly home based players. Hyland is d only exception. Ettie and Humphrey get call up too.